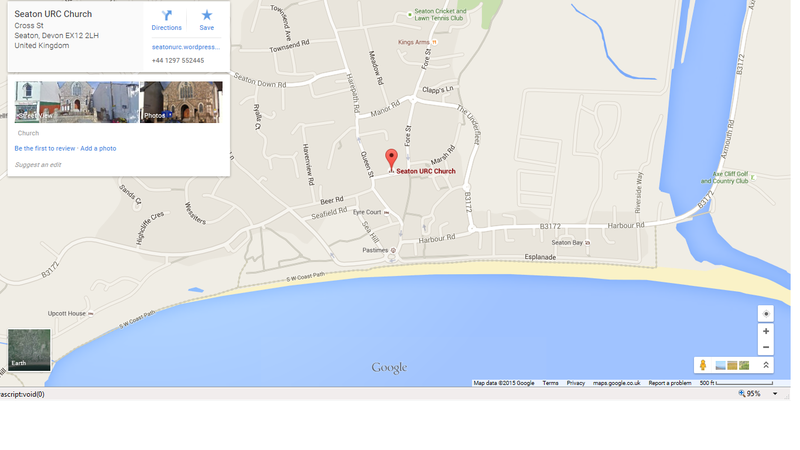 Map showing location of our church in Seaton. Please click on this thumbnail image to see a usable map. Cross street has a one-way traffic flow with entry via Fore Street. We regret not being able to offer off-road parking. On Sundays and between 6.00pm – 9.00am kerbside parking is available in the local area. Beyond these times kerbside parking is limited to 30 minutes. Orchard Road – turn left at the end of Cross Street, follow round into Beer Road and the car park is one hundred yards along on your right. Seaton Jurassic (The Undercliff) – from Colyford Road take first turning off the roundabout, or from Manor Road take the second turning off the roundabout, and the car park is along on your left. Seaton Jurassic (Town Hall) – follow the instructions to get to the Co-op car park (see below), but turn right immediately before entering the Co-op and park beyond the Grove Car Park (see below). Grove Car Park – directions as for Seaton Jurassic (Town Hall) above. Co-op – 1 hour free (still acquire ticket from machine) or two hours (pay at machine). Drive south along The UnderCliff and take the third turning off the roundabout and continue to Co-op. Tesco -2 hours free. Directions as for Co-op (see above) but take the second turning off the roundabout. Turn left into Harbour Road and Tesco is 300 yards along on your left.